The National Park Service (NPS) has announced that Glen Canyon National Recreation Area will modify its entrance fees to provide additional funding for infrastructure and maintenance needs to enhance the visitor experience. Effective June 1, 2018, the entrance fees to the park will be $30 per vehicle or $25 per motorcycle. An annual park pass will cost $55. All of the money received from entrance fees remains with the National Park Service with at least 80 percent of the revenue going back to Glen Canyon National Recreation Area. Revenue from entrance fees remains in the National Park Service and helps ensure a quality experience for all who visit. Here in Glen Canyon National Recreation Area, at least 80 percent of entrance fees stay in the park and are devoted to spending that supports the visitor. We share the other 20 percent of entry fee income with other national parks for their projects. The additional revenue from entrance fees at Glen Canyon National Recreation Area will fund projects such as the Horseshoe Bend Overlook trail, Glen Canyon Trail System, enhanced visitor enjoyment and safety along the Colorado River, and emergency medical services. Glen Canyon National Recreation Area has had an entrance fee since 1996. The current rate of $25 per vehicle or $20 per motorcycle has been in effect since January 1, 2015. The park is one of 117 National Park Service sites that charges an entrance fee; the other 300 national parks will remain free to enter. The National Park Service has a standardized entrance fee structure, composed of four groups based on park size and type. Glen Canyon National Recreation Area is one of 22 sites in group three. 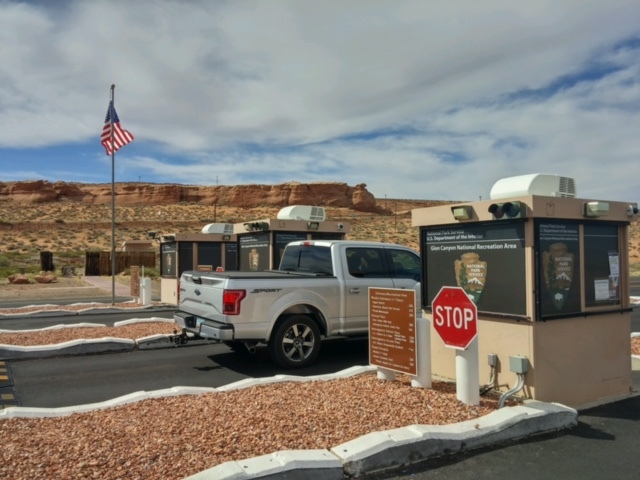 Some parks not yet aligned with the other parks in their category will raise their fees incrementally and fully incorporate the new entrance fee schedule by January 1, 2020.